Wantsûchi (Chronicle of 10,000 Pigs) isn't a ramen shop per se, but is a Chinese restaurant that specializes in tantanmen and serves other dishes as well. The pronunciation is a kind of weird Japanization of the Chinese pronunciation of the same characters, which would be Wanzhuji. A classmate and I stopped off here after seminar one day to see what they had to offer. It looked tasty, and I am a sucker for tantanmen, but I was still skeptical, since all too often Japanese tantanmen that aspires to be Chinese dandanmian falls short, lacking the punch of the chili, numbing peppers, sesame, and hot oil of the original. Ive been to Chongqing and Chengdu and I've had more than a few bowls of tantanmen in Sichuan, so I figured the best I could hope for was a poor approximation. Though, the original Sichuanese dandanmian done right is so delicious, so mind-blowing a noodle that even a poor approximation can be pretty tasty. Wantsûchi offers up an extremely sizeable menu selection of tantanmen, with toppings ranging from extra pork to raw egg to spicy takana greens. They also have several soupless varieties where the noodles sit in chili oil in true Chongqing style. I went with the spicy black sesame basic tantanmen and hoped for the best. The place certainly smelled good, and there were glass jars of different kinds of dried peppers, which was a good sign, but things like that can always be good PR to draw attention away from the poor quality of the food. These tantanmen were the bomb. Although the noodles were a bit thicker than traditional dandanmian, everything else was right on. A thick, thick layer of ground sesame laid over nice red oil, and, shockingly, I could even feel the familiar buzz of the huajiao, the flower pepper, as I got the numbing taste of ma. It wasn't overpowering, but this was the first time I had ever felt it to any degree while eating in Japan. I almost couldn't believe that these noodles were so good. The cook seemed Japanese, since Wantsûchi is a chain restaurant, but they certainly had some assistance from a Sichuanese chef when they designed the recipes, because I have had many, many, many worse bowls of dandanmian than this in Beijing. 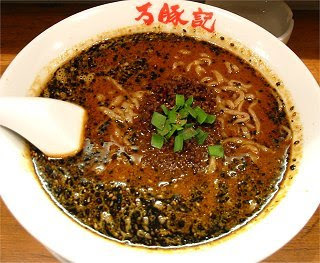 After Wantsûchi I don't think I'll be able to eat Shigeru's black sesame tantanmen anymore, tasty as they were. This is a shop I'll definitely be coming back to once I finish the circuit, since I want to be sure and try all their varieties of soupless noodles!